Seeing that my entry in Breaking the speed limit had “Max Battery Temp 0°C” made me curious. I’ve yet to upload all my data to AirData … whilst I’m trying to decide exactly how to use because of their 100 flight limit for the free version. All my flights up to 6th June 2017 have battery temp data - all three batteries. Then there’s a gap in the data uploaded (although I do have that data) until 24th November, and no battery temp data is recorded/showing after that. 24th November is soon after my MP had been on a quick trip back to DJI to check the gimbal (when they quoted £££ to fix everything but the gimbal, even when there was nothing wrong with that everything else, anyway). Just prior to sending it to DJI, I did update the firmware to whatever was the then current official version. I did notice that @PingSpike’s MP entry also had 0°C. Did I catch my battery discharging? What’s possibly even more strange, is that I have two flights on the same day, with the Mavic Pro, one with battery data and one without. I used different batteries for each flight, perhaps one (or more!) of those batts don’t report temperature?! Any FAQs on Airdata about this? 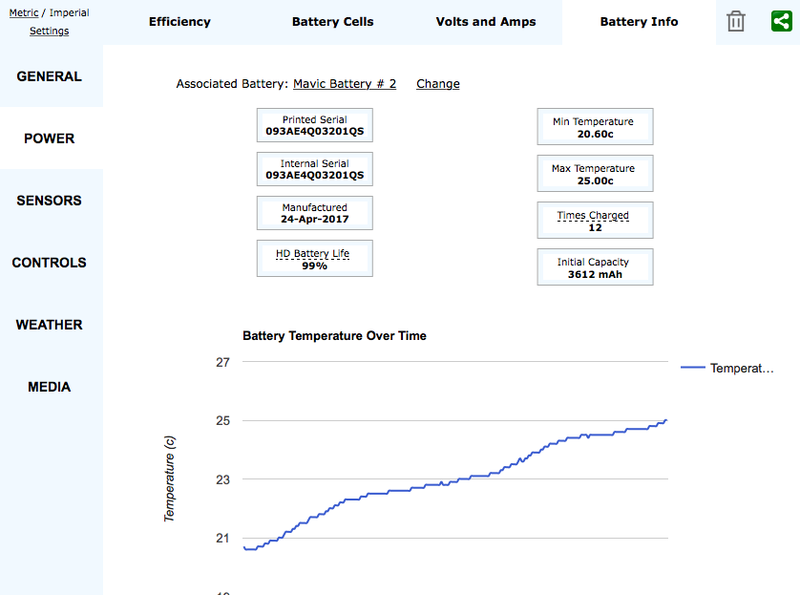 I might do a bit more digging in to my Airdata history and see if this only happens on certain batteries. I’ve just noticed the app version numbers are different on these two flights. The one with no battery data is 4.1.22 which is my custom built GO4 app. But again, why no battery temp data? I’ll check flight history tonight to see if the app version is the cause, rather than the batteries. I’ll have to do a flight with each of my batteries and see if they are all the same. 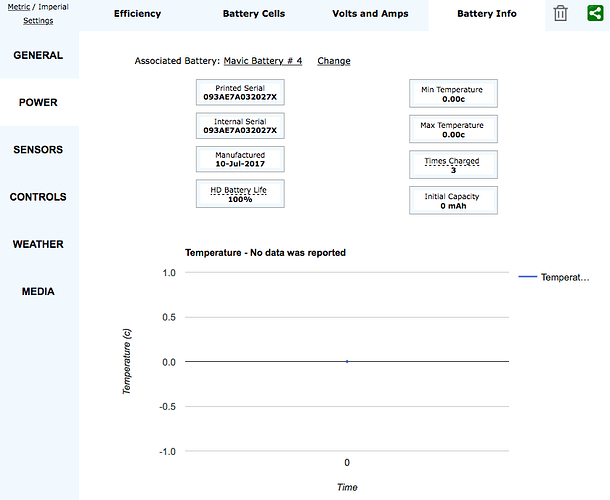 Checked a few at random and it appears I have temps for all batteries, at some point in their life. Spent some more time looking for patterns today, still can’t see one. Interestingly, I’ve been going back to the app version theory for this too. Every single flight using an unmodified GO4 app does have battery temp data. ALL my historic iOS flights have temp data (before I got a CS last year). Then my logs show a clear move to Android and running GO4 4.1.6 on the CS, unmoddded, all has temps too. Then in April 2018 when I started using my modified GO4 app of 4.1.22 - this was the first time I saw flight data with no battery temps. Too much of a coincidence? From that date onwards I’ve only ever flown 4.1.22 modded - and it clearly has very mixed results in terms of battery temp data. I’ll also give the devs on slack a shout to see if this is a known issue. Be interested to know what Android version of GO4 you’re running Dave, and if your pattern of version numbers matches my gaps? Kind of similar mixed messages as I’m finding. I’ve never used Modded Go4 - so I can rule that out. Mine totally stopped some time before last Novermber, and I didn’t tinker with firmware until this Feb time. So we can rule out modded firmware. INTERESTING … that you mention “I guess I did a CS firmware update in mid-november 2017”, and it’s then that mine stopped. As I said at the top, this isn’t long after I got my MP back from DJI, and I’d done an firmware update … THAT HAD A BATTERY UPDATE (one of my batteries bricked and DJI replaced it) … the day before it went back … 5th September '17 … to whatever the version was then. Prior to that I’d never done an update. I’m up to my 100 free entries on AirData, and not made my mind up about how I want to use going forward … so there’s a gap in what I’ve uploaded between June and Nov 17. I do have the missing ones, so might have to upload to determine when it actually stopped. Good that you have a paid sub to AirData … they are more obliged to respond. I uploaded a flight without temps to the PhantomHelp viewer, and downloaded the csv … but no battery temp info, only voltages. 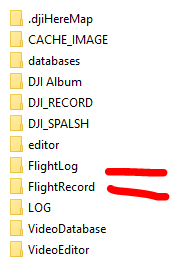 It would be useful to know if that data is missing from the file or if it’s AirData’s conversion, for some reason. So it looks like the raw log file doesn’t contain the temp data then? Hence airdata.com can’t display it either. And I’ve been running .700 on the Mavic since November, and every flight on .700 up until April has had temp data. I’ve not changed any parameters or anything else, until the app version change to the modded version, which I did in April. Too much of a coincidence still! So it looks like the raw log file doesn’t contain the temp data then? Ummm - I read that as PhantomHelp viewer doesn’t extract that info … there wasn’t a column of zeros. There’s lots it doesn’t display. Give me 5 I’ll upload one to there that does have temp data and double check they’re not deleting columns without info. Ah, right, I thought you meant it was all just zeros there too. I’ve used most version between last Sept and 4.2.16 … no temps on any. Just seen there’s 2 versions of CSV from Phantom Help … one seems to have all columns … just doing another d/l. BINGO!!! For whatever reason, it’s not in the log file. AirData are off the hook. 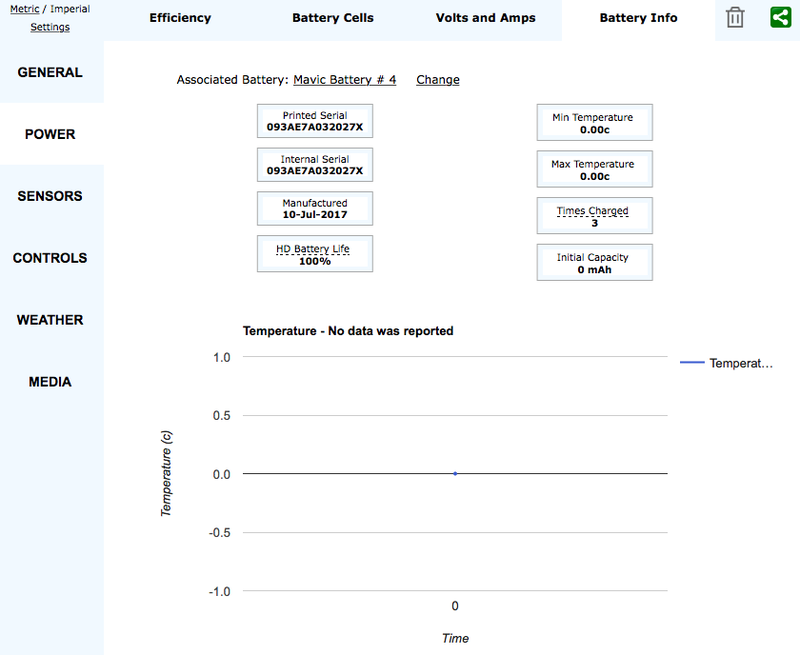 All my batteries are rolled back to .700 too - and again, some of those have data at various times and those same ones also have missing data. I’m thinking this is a core firmware bug? I might rip out al my AirData data and start again … but concentrate on the period from having temps to not having temps (June/Nov '17) … and see if it all goes wrong on that Sept 5th. That’s the last time I can recall a battery update being applied. Edit: Thank goodness for local backups! Thank devilness for my totally disorganised local backups! I might need to check DAT files from the MP, too. I wonder if it’s just app related? Ha! Something else that changed at some time …. Going back to a Sept 17 backup of my phone, the app used to have the .txt files AND the .DAT files downloaded! Not any more! Is there an option in GO4 where you can see battery tempature? I’m sure I’d seen it before but can’t find it. Errr - now you have me thinking - not sure.